If you’re reading this, you don’t need to be informed of the magnitude of the Barcelona – Bayern Munich Champions League semi-final. There were all kinds of storylines and sub-plots to the actual game. Most of them involved Pep Guardiola. It was Pep versus Messi, Pep versus his old club and his old teammate Luis Enrique, then you had Pep versus the machine he had created and every other storyline in between. That was why it was no suprise that Pep started the game in what might be described as an altenative style of play against a team like Barcelona. Guardiola is considered a visionary and the high intensity press that Bayern started with was emblametic of Pep’s thinking. It didn’t work though. 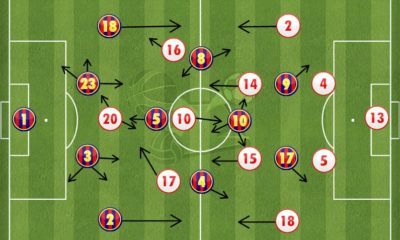 Barcelona lined up as expected with their usual 4-3-3 formation. The three seperate lines of the field and the names that occupy the positions have become synonymous with Lus Enrique and Barcelona this season. Barcelona’s back four have been solid all season along with the midfield trio of Ivan Rakitic, Andres Iniesta and Sergio Busquets. The front three have really hit form as of late and were always going to have the greatest say in how this game transpired. 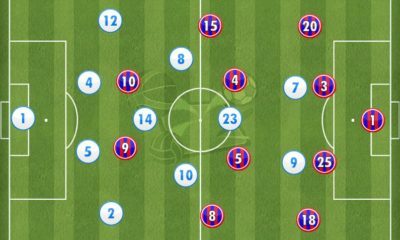 Bayern on the other hand lined up in a typically innovative style and they started with three at the back before switching to a back four before long with Bernat pulling back to make up the four. The problem, if there was one, with Pep’s selection is his wedging of central midfielders into wider areas and forcing all of them to play very narrow. It can work tremendously well but can also prevent them from getting out wide and hurting attacking wingbacks with direct running and overlaps. The game started with the pace setting turned up to the maximum and Pep’s decision to play man to man with only three players at the back against Lionel Messi, Luis Suarez and Neymar was startling. It really is a dangerous game to play against a team who are so good in transition and who have players who can play in tight spaces along with the likes of Messi and Iniesta who can use the ball’s momentum to flick past a defender without breaking the flow of the game and letting opponents close in on them. The combination of Boateng and Benatia struggled to tie down Luis Suarez and his constant pressing was a source of torment for Manuel Neuer along with the defense. Neymar didn’t feature particularly in the first half in an attacking sense but it must be noted that he dropped dutifully to give Barcelona the look of a 4-4-2 when out of possession meaning Rakitic, Iniesta and Busquets could command the middle of the field, cut off supply to the lethal Lewandowski and ultimately eliminate Xabi Alonso’s threat also. 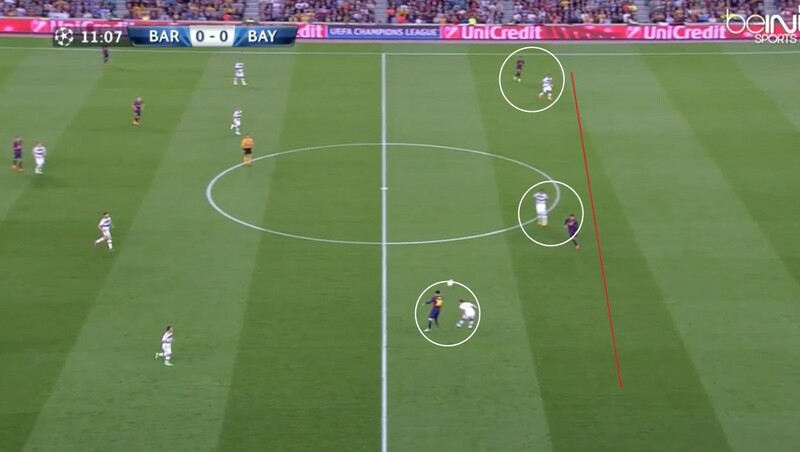 It limited any threat from Lewandowski, particularly, based on the fact that Barcelona played in quite tight lines of four limiting any threat between the lines. 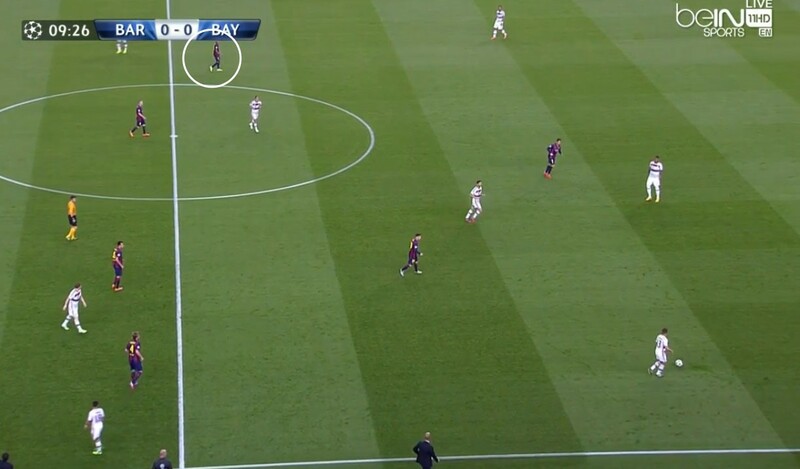 The box to box effort of Ivan Rakitic must also be noted. His hard tackling, hard running and versatile style really affected which way the game was played around the middle and he was also instrumental in Barcelona’s attacking play later in the second half. 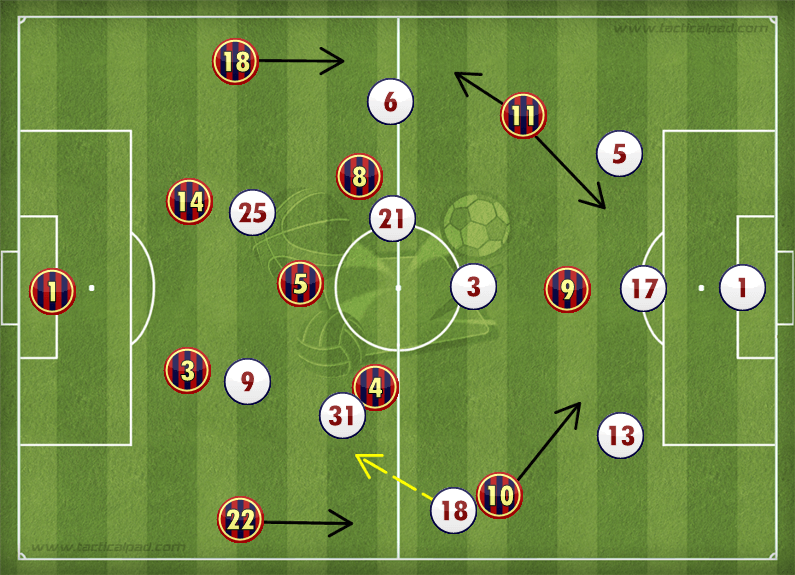 Here is another instance where Barcelona are aligned in a 4-4-2 with Neymar playing as a left midfielder. 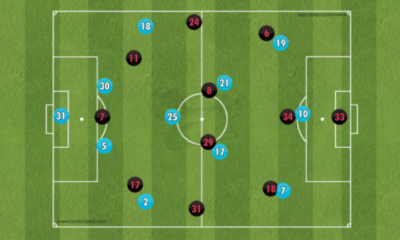 It prevented Barcelona from getting a grip at midfield and resulted in lateral passing and when they did venture into a more direct route, they were closed down and turned over which resulted in several chances for Barcelona. It also meant that Rakitic, Busquets and Iniesta could shiftto the right and mark tighter spaces, leaving tighter spaces between them and forcing Bayern to go long and frustrate Thiago and Schweinsteiger. Pep Guardiola’s fearless tactics broached into the realm of stupdity. 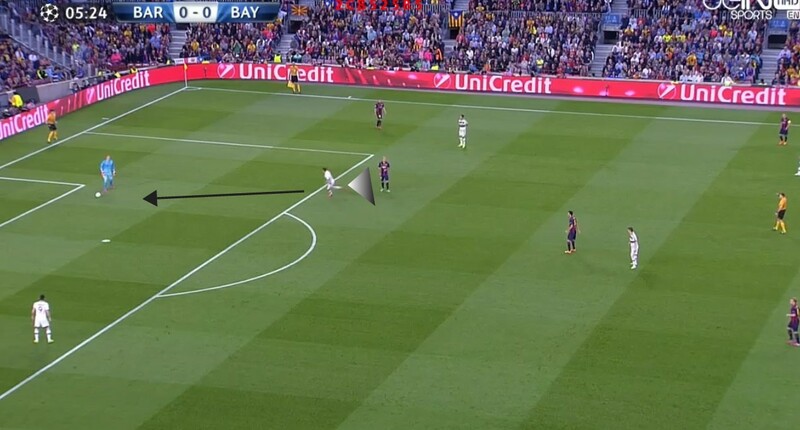 Here is a perfect example of it and one of the several chances that Barcelona had in the first half. For starters, playing anyone one-on-one with Messi is a tall task but to leave Neymar and Suarez isolated also in man-to-man coverage again should be considered suicide. The other aspect of it is the criminally high defensive line. Regardless of Neuer’s status as a game changer or the speed of which he comes off his line, this was insanity from Pep. For as much credit as Bayern and Pep Guardiola are given for being innovative and proactive, they were reactive in Barcelona’s in the first half. 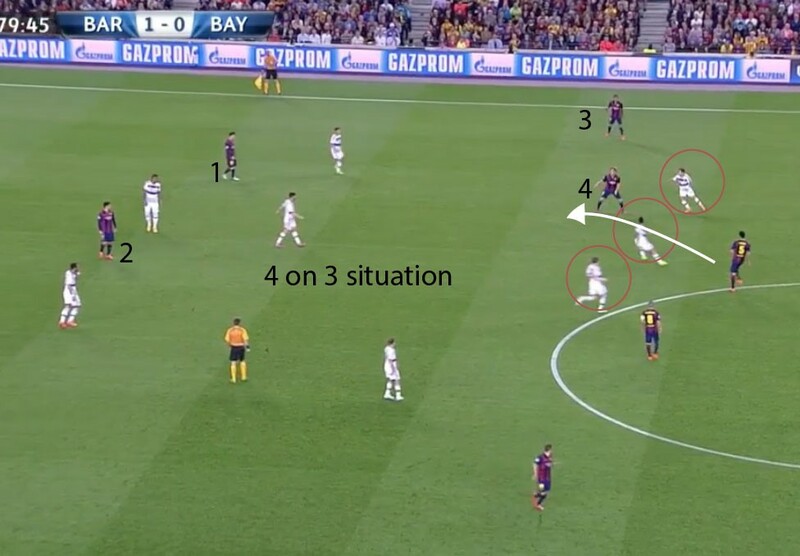 They were relying on what Barcelona were doing as opposed to trying to inflict their gameplan on the home side. Robert Lewandowski played very well as a number nine but never really threatened Barcelona because he was getting very little help from the supple or from his partner in crime, Thomas Muller. More often than not, the movement, communication and technique was something that Bayern could not deal with. Benatia was left in no man’s land and Bayern were opened up. This is nothing to be ashamed of, however, and it appears that Barcelona’s front three look set to terrorize many defenses in a similar fashion for a long time to come. 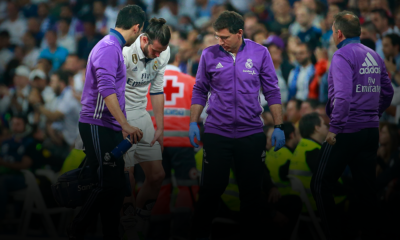 It felt as though Bayern’s forward line was disjointed from the rest of the team. The lack of pace that Ribery and Robben generally bring was lacking from their attack. Schweinsteiger visibly struggled while asking players like Shweinstiger and Thiago to be that kind of creative player from so high up the field and inhibited by the sideline, it can seriously diminish their influence on a game. So much of lewandowski and Muller’s games come from incisive runs out wide and cutbacks from Robben that it as clearly missing last night. As you can see here, Bayern were a victim of may individual errors and lack of communication. At this stage, they were exhausted and a goal down but for three men to collapse in on top of the press resistant Sergio Busquets, only for him to find a simple pass is inexcusable. Rakitic finds Messi with the next pass before turning Jerome Boateng Inside Out. In both images below, you can see Benatia in the white circle contributing nothing to the play. In the second image in particular, he has his shoulders squared and giving himself no chance of turning and chasing Neymar. While, at this stage they were 2-0 down, this was a common facet of Benatia’s night. 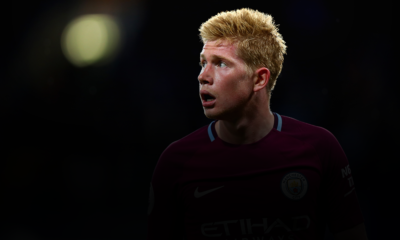 Pep might have let his back three down in the opening exchanges by exposing them badly but their performance was clumsy. Pep Guardiola has a lot of thinking to do as to how to beat Enrique, Messi and the club he played with and managed for the best part of 16 years. The more Bayern push forward, the more susceptible they become and Pep will be aware of this. They are at home in the next round but a 3-0 deficit is too great a deficit to overcome. Robbie is a freelance journalist with a passion for analysing football from a tactical standpoint. He is an Atletico Madrid fan with a passion for learning from the top coaches in the game and is always on the lookout for good quality articles in this area on twitter.